ارتباطات ویروسی، با محوریت وجود پیام ویروسی، به تازگی کاربردهای بسیاری یافته است. وجود ویروس در پیام‌ها باعث می‌شود پیام، خاصیت خود تکراری پیدا کند و سرعت توزیع آن در بین مخاطبان افزایش یابد. هدف پژوهش حاضر نیز مطالعه تأثیر ویروس‌های قابل استفاده در پیام‌ها، بر سرعت انتقال پیام بوده است. 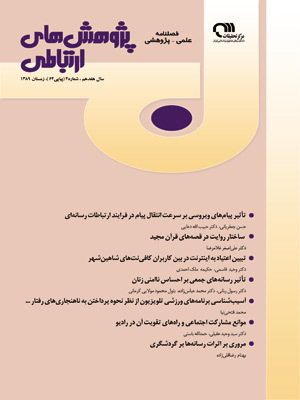 به این منظور مدل جامع ارتباطات ویروسی با بررسی ادبیات موضوع و دیدگاه‌های اندیشمندان این حوزه طراحی شد. برای سنجش این مدل تعداد 57 کارشناس که با روش نمونه‌گیری خوشه‌ای از بین جامعه آماری کارشناسان واحدهای روابط عمومی شهرستان بجنورد انتخاب شده‌ بودند به پرسشنامه‌ای محقق ساخته مشتمل بر 7 عامل و 42 گویه پاسخ دادند. نتایج بررسی معادلات ساختاری مدل نشان داد، تعجب، سرور و ترس بر سرعت انتقال پیام تأثیر مثبت دارند. ویروس غم بر سرعت انتقال پیام تأثیر منفی می‌گذارد و خشم و تنفر تأثیری بر سرعت انتقال پیام ندارند. 2associate prof. in management of Ferdousi Uni. Virus-infected communications, particularly virus-carrying messages, have recently assumed novel applications. The existence of such viruses in a message brings about self-proliferation and hence a huge increase in the speed of dissemination. The present study aims to examine the impact of message viruses on the speed of conveying such messages. To this aim, the researcher designed the Virus-Infected Communications Conclusive Model by employing the related subject's literature and viewpoints of the field's experts. To assess the model, some 57 experts were selected using cluster sampling from the study subjects who were experts working in the Public Relations of Bojnord companies. The samples were given a researcher-made questionnaire including 42 items and 7 factors. The results of analyzing the model's structural equations indicate that surprise, joy and fear have a positive impact on the speed of message-dissemination. The virus of sorrow had a negative impact on the speed of message dissemination, while anger and hatred viruses have no impact on the speed of dissemination. کوبلی، پل. (1387). نظریه‌های ارتباطات: مفاهیم انتقادی در مطالعات رسانه‌ای و فرهنگی (‌ترجمه گودرز میرانی). ج 4، تهران: انتشارات پژوهشکده مطالعات فرهنگی و اجتماعی دانشگاه تهران. رشید‌پور، ابراهیم. (1352). آیینه‌های جیبی آقای مک لوهان. تهران: دفتر انتشارات رادیو و تلویزیون ملی ایران. Borroff, R. (2000). Viral Marketing. Precision Marketing, 20, 12 November. Derbaix, C. & Vanhamme, J. (2003). Inducing Word-of-Mouth by Eliciting Surprise: A Pilot Investigation. Journal of EconomicPsychology, 24 (1): 99-107. Dobele, A.; Toleman, D. & Beverland, M. (2005). Controlled Infection! Spreading the Brand Message Through Viral Marketing. Business Horizons, 48 (2): 143-149. Ekman, P. & Friesen, W.V. (1975). Unmasking the face. Englewood Cliffs, NJ: Prentice-Hall. Gatarski, R. (2002). Breed Better Banners: Design Automation Through Online Interaction. Journal of Interactive Marketing, 16 (12): 2-13. Gruen, T.W. ; Osmanbekov, T., & Czaplewski, A.J. (2006). EWOM: The Impact of Customer-to-Customer Online Know-How Exchange on Customer Value and Loyalty. Journal of Business Research, 59 (4): 449-456. Hirsh, L. (2001). Tell a Friend: Viral Marketing Packs Clout Online. Izard, C.E. (1977). Human Emotions. NewYork: Plenum Press. Laudon, K.C., & Traver, C.G. (2001). E-commerce: Business, Technology, Society. Boston: Addison-Wesley. Lindgreen, A., & Vanhamme, J. (2005). Viral Marketing: The Use of Surprise. In I.C. Clarke & T.B. Flaherty (Eds. ), Advances in Electronic Marketing. (pp. 122-138). Hershey, PA: Idea Group. McLuhan, M. (1964). For Understanding Media. London: Sage. Power, M., & Dalgleish, T. (1997). Cognition and Emotion: From Order to Disorder. Sussex, England: Psychology Press. Rimé, B.; Finkenhauer, C.; Luminet, O.; Zech, E., & Philippot, P. (1998). Social Sharing of Emotions: New Evidence and New Questions. In W. Stroebe & M. Hewstone (Eds. ), European review of social psychology, vol. 9 (pp. 145-189). Chichester, England: Wiley and Sons. Rimé, B.; Philippot, P.; Boca, S., & Mesquita, B. (1998). Long Lasting Cognitive and Social Consequences of Emotion: Social Sharing and Rumination. In W. Stroebe & M. Hewstone (Eds. ), European Review of Social Psychology, vol. 3 (pp. 225-258). Chichester, England: Wiley and Sons. Rozin, P.; Haidt, J. & McCauley, C.R. (1999). Disgust: The Body and Soul Emotion. In T. Dalgleish & M.J. Power (Eds. ), Handbook of Ognition and Emotion, (pp. 429-445). Chichester, England: Wiley and Sons. Scherer, K.R. (1984). On the Nature and Function of Emotion: A Component Process Approach. In K.R. Scherer, & P. Ekman (Eds. ), Approaches to Emotion, (pp. 293-318). Hillsdale, NJ: Lawrence Erlbaum Associates Inc.
Scherer, K.R., & Wallbott, H.G. (1994). Evidence for Universality and Cultural Variation of Differential Emotion Response Patterning. Journal of Personality and Social sychology, 66 (2): 310-328. Scherer, K.R. ; Wallbott, H.G., & Summerfield, A.B. (1986). Experiencing Emotion: A Cross-cultural Study. Cambridge, England: Cambridge University Press. Singh, N.; Zhao, H.; & Hu, X. (2005). Analyzing the Cultural Content of Web Sites. International Marketing Review, 22 (2): 129-146. Welker, C. (2002). Paradigm of Viral Communication. Journal of Information Services and Use, 22: (3-8). Witthaus, M. (2002). Spreading the Word. Precision Marketing, 14 (25): 18. Wood, J.T. (2005). Gendered lives: Communication, gender, andculture (6th ed.) Belmont, CA: Wadsworth.